Ever since opening of the Gegengerade (opposite straight) in January 2013 the capacity of Millerntor stands at 29,063 people and according to FC Sank Pauli this is the exact number of spectators who saw yesterday’s home game against 1. FC Köln. That number now stands as attendance record at the ‘new’ stadium, being under redevelopment since 2006. But even in historical data few games can match this kind of crowd, with initial capacity standing at some 32,000 before being restricted. 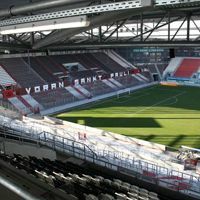 Gegengerade is the third new stand, leaving only the new north end to be done, allowing Millerntor to get above the 30,000-mark. First phase was the southern end (2007), then came new main stand in 2010. Last one should be ready next year, in 2014. Newest addition has been divided to two levels. Lower one, along wishes and traditions of Sank Pauli following, is a massive standing-only terrace, with 13 rows of seating being placed above it. Despite record-setting crowd, home side failed to use the home advantage, losing 0:1.